ow I love to get email from One Roast Chicken subscribers. And this week, boy did I get a great one. Michele signed up for Recipe 1.1 > Roast Chicken with Rosemary, and within minutes she had unsubscribed. Now, some people do sign up for the lovely free recipe, admire the photos, get excited about the possibilities of a roast chicken dinner … and then they unsubscribe. But, no kidding, I think it’s only happened once. Most people stick around to see what happens next 🙂 . Lovely recipes, but not in metric (for New Zealand). Could be converted I know, but makes it more difficult for a novice. Wow. I am very lucky that she took the time to write me this brief message, even on her way out. Yes, I had realized (thanks to Elmira) that I needed to include fahrenheit, celsius and gas mark settings for oven temperatures. But before Michele from New Zealand wrote to me, I hadn’t fully opened myself to the truly global reach of One Roast Chicken, and how everyone was going to come to ORC with their own needs and requirements. I also realized how important it was to me that all subscribers have a positive, successful experience with all of the recipes. Especially beginning and inexperienced cooks. You’re absolutely right. In upcoming recipes I’ve begun to address the issue of pounds / kilograms / cups and fahrenheit / celsius / gas mark — but I haven’t yet gone back and updated the first recipe for Roast Chicken. My apologies. I’d be happy to fix that tomorrow and send it to you. Your honest feedback is just the sort of thing I need to ensure that all of my subscribers are getting their specific needs met; I really appreciate it. Wow, lovely to hear from you. Unfortunately, we metric users miss out on so much from overseas with regard to recipes. I would love to get the updated recipe when you get a chance and appreciate you offering to do that. I actually have a friend in mind who would greatly benefit from your service. She doesn’t cook at all, and is a very busy business woman, but she has a desire to start cooking. She wouldn’t have the knowledge or time to spend converting recipes, so the simpler the better. I got busy and I have now updated Recipe 1.1 > Roast Chicken with Rosemary to include metric measurements. 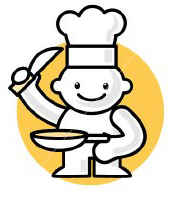 If you signed up for ORC before March 2007, then your recipe does not have the metric equivalents. If want to download the updated version, click here. What do you think? Is there anything else I can do for you to make your life easier? In case you have any problems listening to the update (it might be a bit slow if you’re on a dial-up internet connection), I had the update transcribed, and I wanted to include a copy of it here, so that you don’t miss out. So we were trying to keep costs down, so we picked up some instant soups in a cup, the kind where you just add boiling water, and they were really cheap, less than about 60¢ each sometimes. He ate them very happily for several months. I would put one cup in each lunch every day, no work, very cheap, life is good. Until I read the nutritional label on the side. I’ll admit that I don’t read nutrition labels very religiously. Sometimes, if I’m standing in the grocery store and I can’t decide etween two boxes of crackers, I might check the fat or the sugar content. 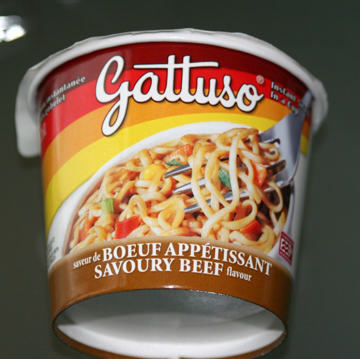 Buy this instant cup-a-soup has 11 g of fat. For comparison, that’s the same as a medium-sized donut, or two pork sausages. But if a regular can of Healthy Choice chicken noodle soup has 2 g of fat, how are they getting 11 grams into instant soup? So we open up the top, look at the ingredients, what do you see? Noodles, it’s kind of salty, a few bits of dehydrated vegetables. That’s it. I pulled out some raw ingredients, similar ones, and I check the labels. Chicken broth? No fat. Beef broth? No fat. Instant Chinese noodles? Again, no fat. It turns out they fry the noodles first before dehydrating them. I can’t tell you why. Unless it makes them taste better. It certainly doesn’t make them any more healthy. I thought I would try to figure out how to make this beef noodle soup from scratch. It took me one or two trials to get the mix of ingredients just right. It’s hard to replace the very salty-MSG flavour, but the new version is super healthy and has 1 g of fat. Now, on Mondays and Wednesdays after supper, I make up a batch of this soup, because each batch makes enough for two days. I don’t want to make too much in advance as I think the noodles would get soggy and weird, but maybe I’m just being careful. After it’s cooked, I divide the soup into two small containers, leave it on the counter to cool until bedtime, then I put them in the fridge. Slightly more work, but cheap ingredients, and much more healthy. Put all ingredients into a medium-sized pot. Bring to a boil. Remove from heat and let sit approximately 15 minutes, or until the noodles are soft and fully rehydrated. Divide into two plastic containers, let cool to room temperature, and then refrigerate. Because I don’t know about you, but when I want grams of fat I’d really rather have a donut than an instant soup. This week I have an audio update for you. I’ve prepared a 3 minute audio message just for One Roast Chicken subscribers. 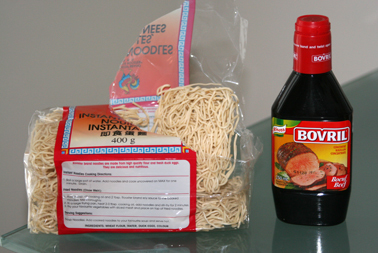 Do you know what instant beef noodle soup and TWO pork sausages have in common? The answer may surprise you.